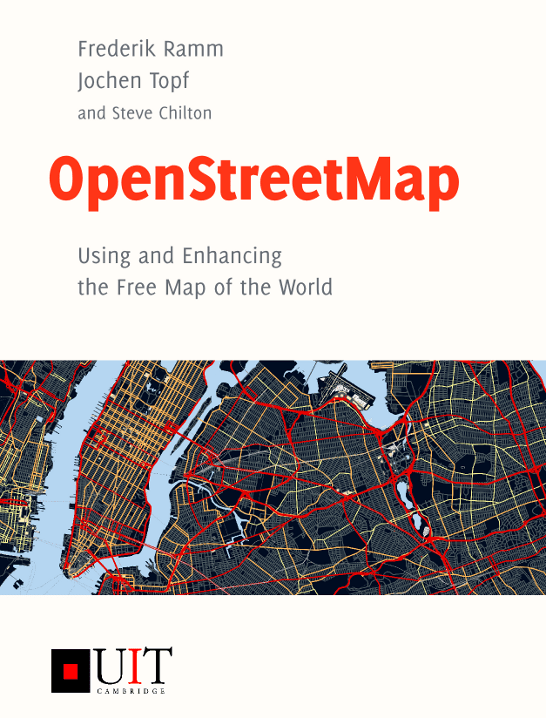 This post reviews the two books about OpenStreetMap that appeared late in 2010: OpenStreetMap: Using and Enhancing the Free Map of the World (by F. Ramm, J. Topf & S. Chilton, 386 pages, £25) and OpenStreetMap: Be your own Cartographer (by J. Bennett, 252 pages, £25). The review was written by Thomas Koukoletsos, with some edits by me. The review first covers the Ramm et al. book, and then compares it to Bennett’s. It is fairly details, so if you want to see the recommendation, scroll all the way down. OpenStreetMap: Using and Enhancing the Free Map of the World is a comprehensive guide to OpenStreetMap (OSM), aimed at a wide range of readers, from those unfamiliar with the project to those who want to use its information and tools and integrate them with other applications. It is written in accessible language, starting from the basics and presenting things in an appropriate order for the reader to be able to follow, slowly building the necessary knowledge. Part I, the introduction, covers 3 chapters. It presents the OSM project generally, while pointing to other chapters wherever further details are provided later on. This includes how the project started, a short description of its main interface, how to export data, and some of its related services such as OpenStreetBugs and OpenRouteService. It concludes with a reference on mapping parties and the OSM foundation. This gives all the necessary information for someone new to OSM to get a general idea, without becoming too technical. Part II, addressing OSM contributors, follows with chapter 4 focusing on how GPS technology is used for OSM. The balance between the technical detail and accessibility continues, so all the necessary information for mapping is presented in an easily digested way even for those not familiar with mapping science. The following chapter covers the whole mapping process using a very comprehensive case study, through which the reader understands how to work in the field, edit and finally upload the collected data. Based on this overview, the next chapter is slightly more technical, describing the data model followed by OSM. The information provided is necessary to understand how the OSM database is structured. Chapter 7 moves on to details, describing what objects need to be mapped and how this can be done by using tags. The examples provided help the user to move from simpler to more complicated representations. The importance of this chapter, however, is in emphasising that, although the proposed tagging framework is not compulsory, it would be wise to do it as this will increase the consistency in the OSM database. The chapter ends with a suggestion of mapping priorities, from ‘very important’ objects and attributes to ‘luxury’ ones. Chapter 8 continues with map features, covering all other proposed mapping priorities. The split between the two chapters guides the user gradually from the most important features to those covered by expert OSM users, as otherwise mapping might have been far too difficult a task for new participants. Chapter 9 describes Potlatch, an online editor which is the most popular. The description is simple and complete, and by the end the user is ready to contribute to the OSM database. The next chapter refers to JOSM, an offline editor designed for advanced users, which is more powerful than Potlatch but more difficult to use – although the extensive instructions make the use of this tool almost as easy as Potlatch. Chapter 11 concludes the review of editors by providing basic information on 5 other editors, suitable for desktop or mobile use. Chapter 12 presents some of the tools for mappers, designed to handle the OSM data or perform quality assurance tests. Among the capabilities described are viewing data in layers, monitoring changes in an area, viewing roads with no names, etc. The second part ends, in Chapter 13, with a description of the OSM licensing framework, giving the reader a detailed view of what source of data should be avoided when updating OSM to save it from copyright violations. Part III of Ramm et al. is far more technical, beginning with how to use OSM on web pages. After providing the necessary information on tiling used for the OSM map (Mapnik and Tiles@Home servers), chapter 14 moves on to the use of OSM with Google Maps or with OpenLayers. Code is provided to assist the learning process. Chapter 15 provides information on how to download data, including the ability to download only changes and update an already downloaded version, explained further in a following chapter. The next three chapters dive into cartographic issues, with chapter 16 starting with Osmarender, which helps visualising OSM data. With the help of many examples, the reader is shown how this tool can be used to render maps, and how to customise visualisation rules to create a personal map style. Chapter 17 continues with Mapnik, a more efficient tool than Osmarender for large datasets. Its efficiency is the result of reading the data from a PostgreSQL database. A number of other tools are required to be installed for Mapnik; however, they are all listed with basic installation instructions. The chapter concludes with performance tips, with an example of layers used according to the zooming level so that rendering is faster. The final renderer, described in chapter 18, is Kosmos. It is a more user-friendly application than the previous two, and the only one with a Graphical User Interface (GUI). The rules used to transform OSM data into a map come from the wiki pages, so anyone in need of a personal map style will have to create a wiki page. There is a description of a tiling process using Kosmos, as well as of exporting and printing options. The chapter concludes by mentioning Maperitive, the successor to Kosmos to be released shortly. Chapter 19 is devoted to mobile use of OSM. After explaining the basics of navigation and route planning, there is a detailed description of how to create and install OSM data on Garmin GPS receivers. Additional applications for various types of devices are briefly presented (iPhones, iPods, Android), as well as other routing applications. Chapter 20 closes the third part of the book with an extensive discussion on licence issues of OSM data and its derivatives. The chapter covers the CC-BY-SA licence framework, as well as a comprehensive presentation of the future licence, without forgetting to mention the difficulties of such a change. Part IV is the most technical part, aimed at those who want to integrate OSM into their applications. Chapter 21 reveals how OSM works, beginning with the OSM subversion repository, where the software for OSM is managed. Chapter 22 explains how the OSM Application Programming Interface (API) works. Apart from the basic data handling modes (create, retrieve, update or delete objects and GPS tracks), other methods of access are described, as well as how to work with changesets. The chapter ends with OAuth, a method to allow OSM authentication through third party applications keeping the necessary user information. Chapter 23 continues with XAPI, which is a different API that, although offers only read requests and its data may be a few minutes old, it allows more complex queries, returns more data than the standard API (e.g. historic versions) and allows RSS feeds from selected objects. Next, the Name Finder and Nominatim search engines for gazetteer purposes are covered. Lastly, GeoNames is mentioned, which, although not an OSM relative, can be used in combination with other OSM tools. Chapter 24 presents Osmosis, a tool to filter and convert OSM data. Apart from enabling read and write of XML files, this tool is also able to access PostgreSQL and MySql databases for read and write purposes. It also describes how to create and process change files in order to continually update a local dataset or database from the OSM server. Chapter 25 moves deeper into more advanced editing, presenting the basics of large-scale or other automated changes. As such changes can affect a lot of people and their contributions, the chapter begins with ‘a note of caution’, discussing that, although power editing is available to everyone, a contact and discussion with those whose data is to be changed should be made. Chapter 26 focuses on imports and exports including some of the programs that are used for specific data types. The final chapter presents a rather more detailed overview of how to run an OSM as well as a tile server, covering the requirements and installation. There is also a presentation of the API schema, and alternatives to the OSM API are also mentioned. The book ends with the appendix, consisting of two parts, covering geodesy basics, and specifically geographic coordinates, datum definition and projections; and information on local OSM communities for a few selected countries. Overall, the book is accessible and comprehensive. Now, we turn to review the second book (Bennett) by focusing on differences between the two books. Chapters 1 and 2 give a general description of the OSM project and correspond to the first three chapters of Ramm et al. The history of OSM is more detailed here. The main OSM web page description does not include related websites but, on the other hand, it does describe how to use the slippy map as well as how to interact with data. The chapters also focus on the social aspect of the project, briefly presenting more details on a user’s account (e.g. personalisation of the user’s profile by adding a user photo, home location to enable communication with other users in the area or notification of local events). Chapter 3 corresponds to chapters 4 and 5 of the first book. There is a more detailed description of how GPS works, as well as of how to configure the receiver; however, the other ways of mapping are less detailed. A typical mapping example and a more comprehensive description of the types of GPS devices suitable for OSM contribution, which are provided in Ramm et al., are missing. Chapter 4 corresponds to chapters 6, 7 and 8 of the first book. Some less than important aspects are missing, such as the data model history. However, Ramm et al. is much more detailed on how to map objects, classifying them according to their importance and providing practical examples of how to do it, while in this chapter a brief description of tags is provided. Both books succeed in communicating the significance of following the wiki suggestions when it comes to tagging, despite the ‘any tags you like’ freedom. An interesting point, which is missing from the first book, is the importance of avoiding tagging for the renderer, explained here with the use of a comprehensive example. Chapter 5 describes the editors Potlatch, JOSM and Merkaartor, corresponding with chapters 9, 10, and 11 of Ramm et al. Having the three editors in one chapter allows for a comparison table between them, giving a much quicker insight. A practical example with a GPS trace file helps in understanding the basics operation with these editors. More attention is given to Potlatch, while the other two editors are described only briefly. No other editors are described or mentioned. Chapter 6 provides a practical example of using the three editors and shows how to map objects, which was covered in chapters 6, 7 and 8 in the first book. While the first book is more detailed and includes a wider range of mapping cases, here the reader becomes more familiar with the editors and learns how to provide the corresponding information. In addition to the material in the first book, here we have an example of finding undocumented tags and using OSMdoc. Chapter 7 corresponds to chapter 12 of the first book, with a detailed description of the four basic tools to check OSM data for errors. However, Ramm et al. offers a broader view by mentioning or briefly describing seven other error-checking tools. Chapter 8 deals with map production, similar to chapters 2, 16 and 18 of Ramm et al. The Osmarender tool is described in detail in both books. Kosmos renderer, however, is described in much more detail here, although it is no longer developed. The chapter’s summary here is very useful, as it presents briefly the 3 rendering tools and compares them. What is missing from this book, however, is a description of Mapnik (chapter 17 of Ramm et al.) and also the use of tiling in web mapping. Chapter 9 corresponds to chapters 15, 22 and 23 of Ramm et al. Regarding planet files, Bennett provides a description of a way to check the planet file’s integrity, which can be useful for automating data integration processes. Moving on to OSM’s API, this book is confined to describing ways of retrieving data from OSM, unlike the first book that also includes operations to create, update or delete data. XAPI, however, is more detailed in this book, including how to filter data. In this chapter’s summary a brief description and comparison of the ways to access data is helpful. On the other hand, Ramm et al. briefly describes additional APIs and web services that are not covered here. Chapter 10 matches chapter 24 of the first book. In both cases Osmosis is described in detail, with examples of how to filter data. The first book includes a more complete description of command line options, classified according to the data streams (entity or change). This book, on the other hand, is more explanatory on how to access data based on a predefined polygon, and further explaining how to create and use a customised one. The first book mentions additional tasks, such as ‘log progress’, ‘report integrity’, ‘buffer’, ‘sort’, while here only the latter is used during an example. An advantage of Bennett’s book, however, is that the use of Osmosis with a PostgreSQL database, as well as how to update data and how to automate a database update procedure, is explained more comprehensively and extensively. The last chapter talks about future aspects of OSM. The OSM licence and its future development is explained in a comprehensive way, corresponding to the end of chapter 20 of the first book, with the use of some good examples to show where the present OSM licence is problematic. However, throughout Bennett’s book, licence issues are not covered as well as in Ramm et al. (chapters 13, 20), and the reader needs to reach the end of the book to understand what is allowed and what is not with the OSM data. Moving on, MapCSS, a common stylesheet language for OSM, is explained in detail, while in the first book it is simply mentioned at the end of chapter 9 during a discussion of Potlatch 2. The book ends with Mapzen POI collector for iPhone, covered in chapter 11 of the first book. When compared to the first book, what is missing here is the use of OSM for navigation in mobile devices (chapter 19), large-scale editing (chapter 25), writing or finding software for OSM (chapter 21) and how to run an OSM server (chapter 27). Another drawback is the lack of coloured images; in some cases (e.g. chapter 7 – the NoName layer) it is difficult to understand them. So which book is for me? Both the books more or less deal with the same information, as shown by the chapters’ comparison and sequence. Although there are areas where the two books are complementary, in most cases Ramm et al. provides a better understanding of the matters discussed, using a broader and more extensive view. It addresses a wide range of readers, from those unfamiliar with OSM to the advanced programmers who want to utilise it elsewhere, and is written with a progressive build-up of knowledge, which helps in the learning process. It also benefits from the dedicated website where updates are provided. Bennett’s book, on the other hand, would be comparably more difficult to read for someone who has not heard of OSM, as well as for those in need of using it but who are not programming experts. There is a hidden assumption that the reader is fairly technically literate. It suffers somewhat from not being introductory enough, while at the same time not being in-depth and detailed. As the two books are sold at a similar price point, we liked the Ramm et al. book much more and would recommend it to our students.